I finally got a copy of my X-Rays! Here is why I hadn't been posting for a few weeks. Nothing is busted, but it sure did hurt. Shouldn't this have gone up for No Carbon Wednesday? Good luck that it didn't come all the way off and get lost, pretty easy to lose a tiny little finger like that. 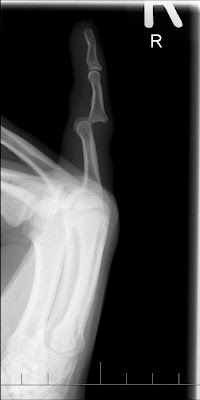 Dislocation of the fifth finger! I sent to you two pics of a broken handlebar! I did that, don't recommend riding downstairs on CX bike wearing dress shoes! Nine months of rehab later it is still bent. If you fractured your Volar Plate you can look forward to living through months of rehab.